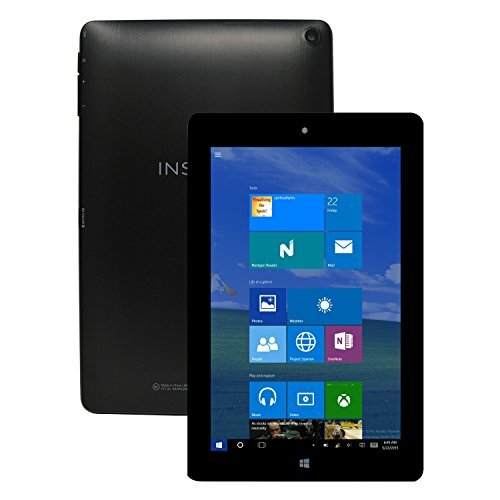 Sleek and powerful, the Insignia Flex Tablet is the all in one compact electronic powerhouse you've been looking for. The Insignia Flex Tablet features a 8.9-inch 1920x1200 High-resolution IPS screen with a 16:10 aspect ratio for vivid picture quality to play, read, watch, stream or work. Weighing less than 1 pound, the Insignia Flex is a compact and sleek tablet that you can take with you just about anywhere. The Insignia Flex comes with the Windows 10 Home OS, 32GB of internal memory that can be expanded up to 128GB with the microSD card slot, and an Intel Atom quad-core processor to power your applications. With WiFi and Bluetooth support built-in, the Insignia Flex can connect with everything you need at home and on-the-go. Video chat or capture your favorite moments with the 2MP front webcam and 5MP back camera and integrated microphone. This Certified Refurbished product is tested & certified by Insignia to work like-new. The product includes all accessories listed below, and is backed by a 90-day warranty. If you have any questions about this product by Insignia, contact us by completing and submitting the form below. If you are looking for a specif part number, please include it with your message.